Almost 10 years ago our friends took us to one of the wineries that they liked – Paradise Ridge. It was the last day of a beautiful 3-day Sonoma trip mid-December, right in between two big holidays with inevitable crowds, so we had most of the places to ourselves. It was a magic trip. There are many good wineries in our region. Some of them look like a small castle or château. It wasn’t the case with Paradise Ridge: it looked quite ordinary from the outside. If you expected that the next phrase would be about the great interiors, I tricked you: while it was very nice and perfectly suitable for their specialty – wine tasting and weddings, a large second floor banquet room, a ground floor tasting room and even a wooden deck with tables for picnic under a huge oak tree – weren’t the best part of this winery experience. But the view that opened from each of those areas was just breathtaking. That view alone would have been probably enough to visit that place from time to time, but they also produced wine that we liked very much. And about 8 years ago we became Paradise Ridge Wine Club members. Since I haven’t been to wine regions in any other country, I do not know how common are wine club memberships in countries where my readers live, so I’ll just quickly explain that in the U.S. it usually means that you “subscribe” to get a certain number of bottles during one year, and the winery sends you those bottles (of their choice but with 15-20% discount from their regular prices) 3-6 times a year. This is done either prepaid for that year or in installments when they ship (or, as we prefer to do, when we pick up our shipments). 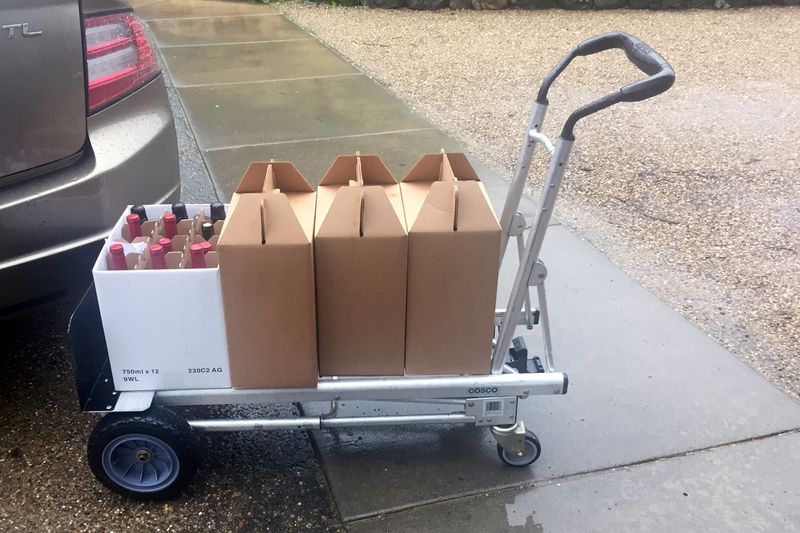 Small family owned wineries like Paradise Ridge rarely sell their wines to retail stores: they do not produce enough to benefit from volume sales. So wines that they produce are sold mostly to the club members and in their tasting rooms. Over years we went there dozens of times – just two of us, with local friends and with friends and relatives visiting from other states. We became… not friends but very good acquaintances with the wine maker and several people who worked at the Paradise Ridge winery. So we kept coming back for great wine, beautiful views and an improvised park with periodically changing strange metal sculptures – just a perfect setting to spend time walking and taking pictures in between visiting other wineries and doing more tasting. One of those sculptures became Paradise Ridge’s trademark (and I shared it with those who were here five years ago in one of my “postcard” posts). On October 9, when we heard about fires that broke out Sunday night in that region, my first thoughts went to Paradise Ridge and Sunce (our second most favorite winery). As always in such cases, at the same time there was too much and not enough information. I kept telling myself that what were the chances that the fire happens there? Moreover, Paradise Ridge was on the top of the hill, away from other houses and structures… Midday their Facebook page brought the news I feared: the winery completely burned down. I cried. It felt like a personal loss. Pictures below are from their Facebook page taken hours after the fire. You can see all the smoke in the air. It was Monday last week. We didn’t know yet how bad the fire would get. Eleven days later, it’s about 80% contained. By estimate, so far it scorched more than 210,000 acres, burned 6,000 houses/buildings and killed at least 42 people, most of them elderly residents of the area who couldn’t evacuate in time – the fire moved extremely fast. 50 people are still considered missing, and about 20,000 people still didn’t return from the mandatory evacuation. Official air quality in the area where I live (70 miles from the closest affected area) is back to green “Good” (from scary red “Unhealthy” last week) and it is “Moderate” in the area of fires. It a big catastrophe from which we will be recovering for months if not years to come. When we hear or read about such events somewhere in the world, we sympathize and feel sad, on some level, but we do not feel it as acute as when it happens close to us or to somebody we actually know – and its normal, otherwise we wouldn’t be able to live and function in our age of communications, where every week brings bad news from somewhere, hopefully far-far away from us and people we love. So while I predict bad fallout from this situation for the area and many-many people, I can’t help feeling relieved and rejoicing from (finally) good news: all people who I care about are fine: Paradise Ridge owner families are alive; Laurie Erikson (Sonoma Scent Studio) safely returned to her house and studio after a week of evacuation. 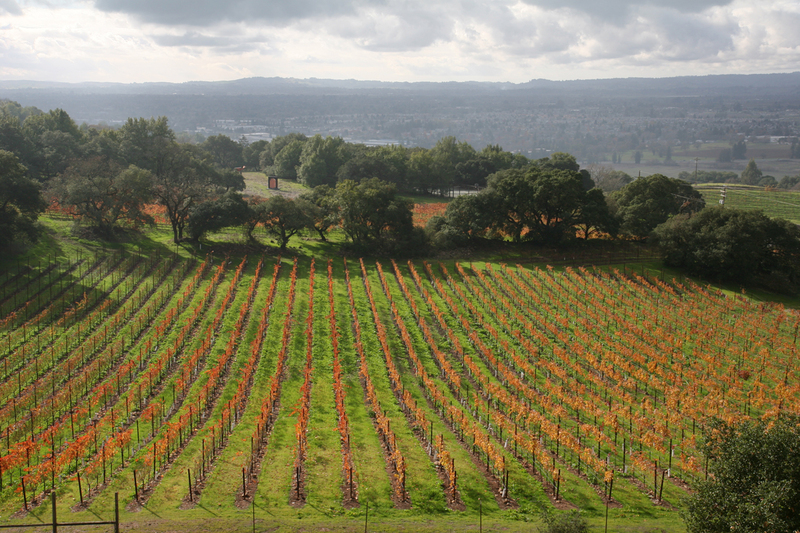 And, according to the most recent reports, Paradise Ridge vineyard survived – so there will be crop next year. Drinking “boutique wines” is luxury (same as wearing perfumes), and we would have been fine with or without our favorite wines. But running wine business, same as producing artisan perfumes, is not a luxurious undertaking: it’s a lot of hard work and very low profitability (at least until a big brand comes and buys you out). So I’m happy not as much for the fact that we’ll get to enjoy Paradise Ridge wines or Sonoma Scent Studio perfumes but mostly that they will be able to keep creating them. As I’m finishing writing this post, it has started raining outside. It would have helped much more had it happened a week ago but I’m happy about this rain: it is time the Nature joined us in crying. This entry was posted in "Four legs good", A Postcard from Undina, In Vino Veritas, Random Stuff and tagged Paradise Ridge, Sonoma, Sonoma fires, Sonoma Scent Studio. Bookmark the permalink. So heartbreaking. I watched the news with increasing shock – to see the devastation the fires have wrought made the Californian landscape look like there had been a nuclear explosion. As you say, these businesses have been built through hard work and determination through the years, and it is a relief that all this – at least for them – has not been lost. My thoughts go out to everyone. Thank you for writing so movingly about it. Thank you, Jillie. It was building in me over the week and I felt that I needed to share with this group – so that you know how I feel and to put out into the Universe good words and feelings towards people that brought me and many of people I love a lot of joy. Very moving post. Glad the families connected with the winery are okay, and that the vineyard itself will go on. But what devastation and loss for the whole community in that area. On a lighter note, I totally get Rusty’s proprietary paw. Every time we return with our wine bounty, Rusty insists on paw and nose inspection of everything we brought in. I really hope the area will rebuild, and people will find all the help they need. Unfortunately, it’s a really tough housing market here now so it’s not clear how it will all resolve in short(er) term. We’ll see. This is so sad, a place you cherished got devastated and the beautiful views that once made you hold your breath are now painful to look at. Nature sure is twisted. It can reward people but it can also punish them. I’m sorry, I’m sure you felt like you lost a friend in such case. It’s a relief that Paradise Ridge people are safe and so is Laurie. It did feel like a loss. There were so many great memories about happy times there, which felt like lost forever… I immediately told my vSO to hide far away any wines we had from Paradise Ridge: had the vineyard burned, the next crop would not have happened before at least 5 years from now. I’m happy that they all are safe, and that they plan to rebuild everything. I was holding my breath through the fire part of this excellent post, hoping that it was “only” the house, not the wine yard itself which had been burned down. As you say, artisan undertakings are hard work. Over these bad days I used Rusty’s fur as a filter: I would sniff his fur to get away from the awful smell in the air (and then we bought air purifiers – not to traumatize the cat further with too much close contact :) ). I was so happy to read that they were safe, and the vineyard survived (though, if I understood it correctly, all the wine that was in making is gone – we saw somewhere pictures of wine streams running down the road). I hope they will have enough determination to rebuild. Thank you for this post; the fires have been horrible, and one feels so helpless on the other side of the country, seeing the devastation. It is hard to believe how much stronger than a man Nature is – be that water, or fire, or earthquakes :( We had more than 10,000 firefighters trying to stop that disaster – and they couldn’t. The devastation is heartbreaking. Thanks for sharing this story. I was so happy to read Laurie’s blog post that she was able to return home and her cottage was spared; so many others did not have that luxury. I hope your winery is able to rebuild and continue to make their wine. I know that I’m anxiously awaiting the reopening of Laurie’s online store because I love her perfumes and more than ever want to support her. Yes, it is lucky that people we know didn’t suffer as badly as it could have been. The outcome of that fire will be affecting a lot of people many months after it stops being the first page news – and I feel really bad for them. I look forward for the holidays when Laurie re-opens her online store. Thank you, Suzanne. I was just looking through the pictures I took of you with different sculptures in Paradise Ridge back then. I enjoyed our trip very much. Let’s hope that by the time you decide to come here again there will be an even more beautiful place to have our picnic. It really is heartbreaking to read your post and listen to news. The bad news seems to be pervasive these days wherever you turn. I do wonder who the owner of Sunce is because in Croatian it means the Sun. True. Both nature- and man-made disasters were especially brutal recently. You’re correct: the owner and a wine maker of Sunce is from Croatia. If you come for a visit, we’ll definitely take you there: they are very warm people, and we like both their wines and their winery – even though it’s not as visually impressive as Paradise Ridge was. So very sorry your special favorite winery lost their buildings to the fire. I hope they are able to rebuild. These fires have been devastating to Napa and Sonoma counties, and it all happened so fast. I am incredibly lucky to be able to go home after evacuation and find our street ok. Hugs, Undina, and thanks to all for your love and support. Laurie, my vSO and I were thinking of you from the first moment we learned about those fires and until I read that you were able to return to your house. I’m glad your house is safe. Take care of yourself. I’m sorry about your friend’s loss and the loss of a place that was special to you as well. Glad that they are safe though. This has been a few months of relentlessness from Mother Nature and shown us how powerless we really are. Thanks for sharing your “up close” perspective. I like tasting and buying wines probably more than I like actually drinking :) So visiting wineries is one of my favorite mini-vacation types. I know almost nothing about South Africa wines – I’ll need to look up that region and get to try anything produced there. Very touching post, Undina. Glad everyone is safe but so heartbreaking to lose a place with a lot of history for you and your VSO and it looks like Rusty knows that too! Hugs. Thank you for reading, hajusuuri. It helps when friends share your worries. Rusty was a big help through the bad days we had here… And, as I discovered, he likes the sound of the air purifier that we bought to help with the allergies that immediately started acting up when the smog reached our area. Extremely moving post..Thank you for this post; the flames have been unpleasant, and one feels so powerless on the opposite side of the nation, seeing the destruction.